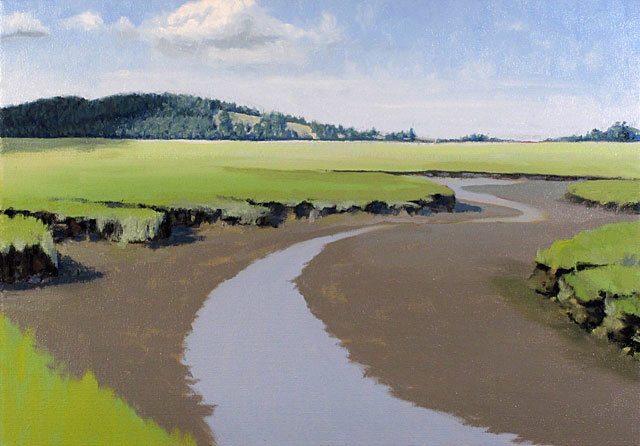 This is what I’m currently working on — a view of the Essex River marsh and Hog Island at low tide. I made a color sketch on-location as the clouds came and went (each time I was in the shadow of one, clouds of no-see-ums would swarm me). This view is awe-inspiring, but usually difficult to paint (satisfactorily) since it’s mostly a flat green plane out to the island. But, with the tide out and a low westering Sun, I had some nice dark shadows for definition. Here’s a challenge for a painter: How do you mix the color for a distant yellow pasture? You just mix a grayish, bluish, but not greenish, light yellow! Easy, right?! Hmmm.